April 15, 2016. Published in announcement. Tagged under electron, desktop, gui. 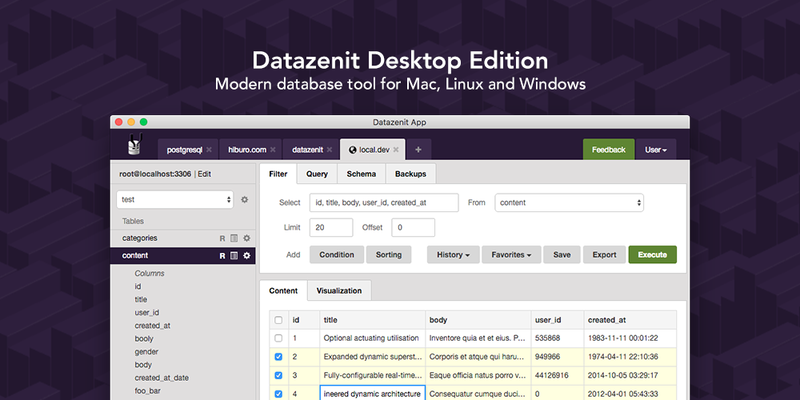 We are proud to announce Datazenit Desktop Edition for Windows, Mac and Linux. The new desktop edition is built on top of Electron framework and offers better UX and integration with operating system. 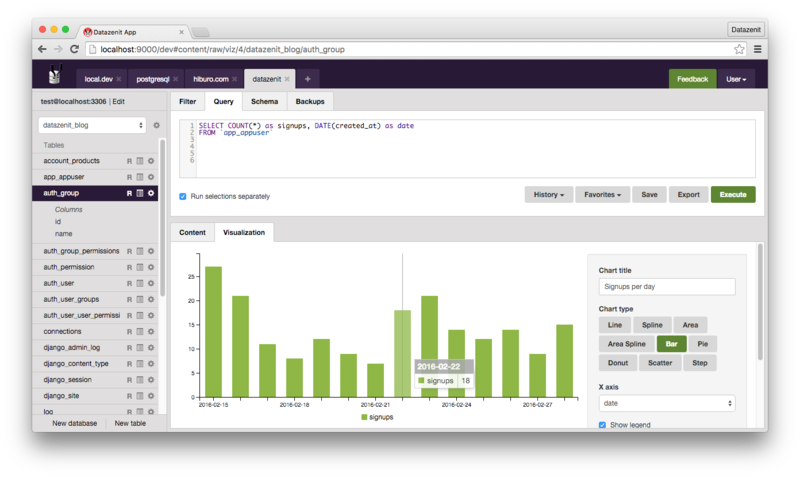 Datazenit is a modern database administration tool for MySQL and PostgreSQL. 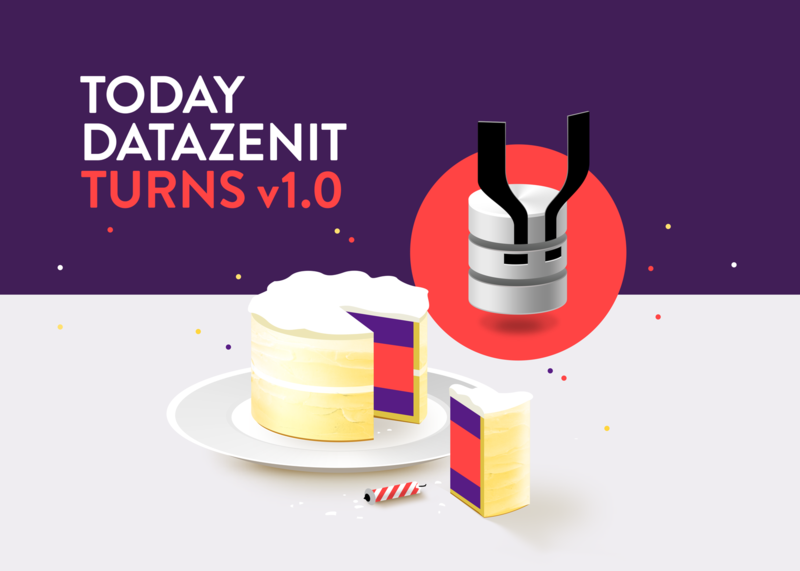 Last month we launched Datazenit 1.0.0, our first public release. Up until now Datazenit was only available as a self-hosted web-based app that had to be started from terminal and accessed via browser. We thought that we can do better and decided to build a fully-integrated desktop application that is easier to use and quicker to try out. Datazenit Desktop Edition works on all major operating systems: Mac OS X, Linux 32/64bit and Windows. The Windows package comes bundled with Java, but on other operating systems you will have to make sure that Java is present on the system. Datazenit Desktop and Server Editions are available for download. March 1, 2016. Published in announcement. Tagged under mysql, release, v1.0, gui, postgres, launch. Hello there! Today we are excited to announce the end of beta-testing phase. 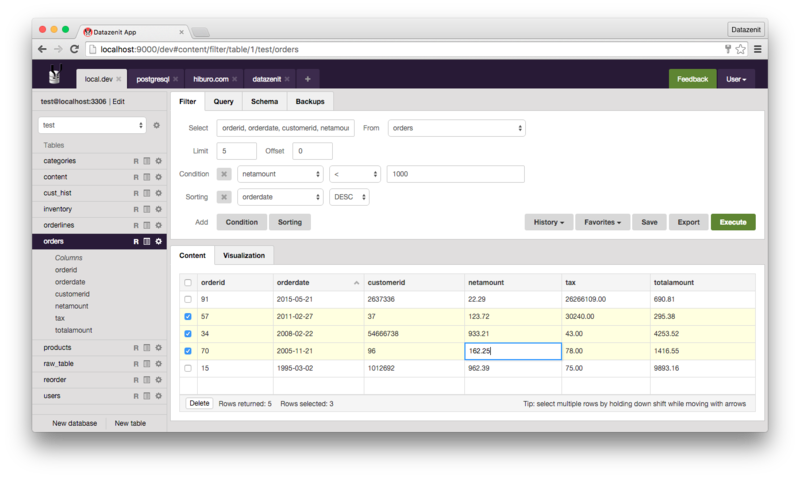 Please welcome Datazenit v1.0 - a web-based database administration tool! This version is officially available for everyone. Two years and more than 1600 people involved in beta-testing resulted in what we are proud to share with you today. Intuitive query builder for both professional developers and less tech savvy users. Datazenit is very attentive to the active feedback and suggestions from our beta-users. We were able to maximize the tool’s performance and its overall usability because of the extensive feedback. Apart from that we are happy to share some of the exclusive functionality below. Data visualizations can be shared with team members and embedded on a website. Content editor with keyboard navigation and multiple editing tools. Collaborate with team members – share connections, queries and charts. Find out more about us and our philosophy here. For current pricing please head over here. November 2, 2015. Published in community. Tagged under news, meta. We have created a community forum for all interested parties - beta users, our customers, database enthusiasts and developers. It is powered by an excellent open source discussion platform Discourse, created by Jeff Atwood. Authorization works using existing Datazenit Store accounts – you just need to use the "Sign in" button in the forum and you will be logged in via datazenit.com. This is implemented via SSO which is supported in Discourse out of box. Don't forget to introduce yourself – we would love to hear more about you. If you have something you are currently working on and want to share there is a topic for that. Another topic worth checking out is the official Changelog thread where we post latest release info. During the beta testing period we are releasing a new version at least once a week. If you have found an issue or bug in Datazenit please report them in Bug Reports thread. Want to participate in beta testing, but don't have access? Request beta invite here. May 19, 2014. Published in scala. Tagged under database management, scala, python, great software, jvm. The beta release got a little bit delayed because we are currently moving Datazenit to Scala. Scala is a scalable, statically typed and object-functional programming language. It compiles to Java bytecode, which runs on Java Virtual Machine. Why should you care? JVM allows more flexible deployments to cross-platform targets and will make the setup for self-hosted customers a breeze. Scala's type system has made Datazenit less prone to bugs and has improved the overall performance. When we first started Datazenit the language of choice was Python. Since then the project has evolved, we have learned our target audience better, and Python has become less suitable for the goals we are trying to achieve. This may sound like huge change, but in fact it is not. The good news is that the move to Scala is 90% finished. You can expect an update pretty soon. Great software takes time and we don't want to make any compromises on that regard. January 10, 2014. Published in alpha, features. Datazenit is currently in alpha version. Closed testing has begun and tonight we think it's time to shed some light on one of the key features of Datazenit: visualizations. 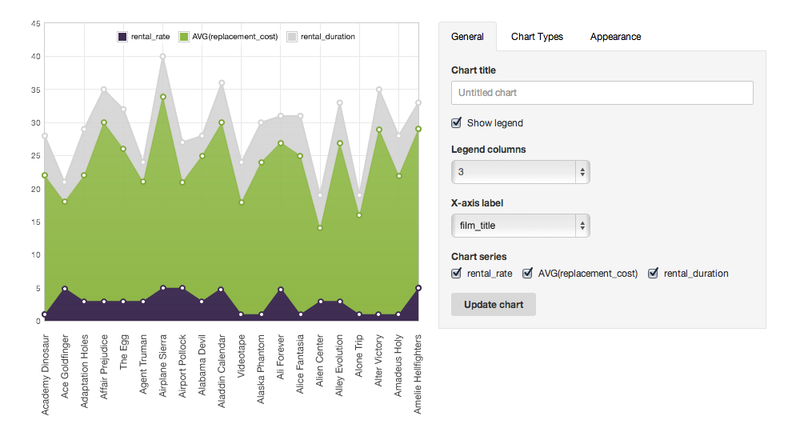 We are planning to release Datazenit with at least six types of charts: line, spline, scatter, pie, bar and area chart. The range of charts will be continuously extended. Community will be able to extend functionality for Datazenit, e.g., via 3rd party plugins. Some of the already available settings of visualizations can be seen in the examples below – it's a select from a movie rental database. Visualizations can be edited in the settings box alongside, the changes appear in real time. The same goes for editing the select query – data set is updated instantly. Visualizations can be customized by adjusting pre-defined chart themes, line width, opacity and curve smoothing options, legend positioning and format, labels on axis, resizing chart & more. This is our first post in a series of upcoming insights into Datazenit leading up to the beta test. Stay tuned! January 10, 2014. Published in intro. Tagged under oracle, postgresql, mssql, mysql. Datazenit is a web based solution for database administration. Its abilities go beyond the standard tools of a rich content editor, and include data visualizations, an intelligent schema builder, and many other features that ease and enhance database management. Datazenit is designed to make databases accessible, safe and easy to use. Our final goal is to support many different data sources, but we will start with some of the most popular relational databases: MySQL, PostgreSQL, Oracle & MSSQL. You can find more info in features section.